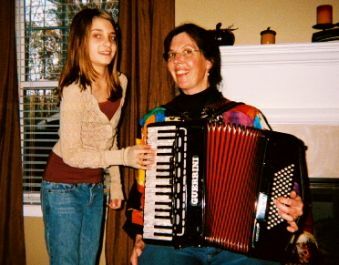 Workshop: How To Play By Ear - Do you play a folk instrument: violin/mandolin, guitar, flute/whistle, banjo, etc., and wish you could move beyond the tune book and play your instrument by ear? We are offering a three-part introduction to the basic skills needed to open your ears and free up your playing. This workshop will help increase your enjoyment of your instrument and enable you to play more freely alone or with others! Beginning July 13. Contact us for more information! A Day of Dance: We teach, call and play New England contra dance, folk dances from around the world, and "make your own dance" programs. End the day with an evening family dance! Time Travel: A Musical Journey Through New Hampshire History. Songs, instrumental music and dance from the days of the settlers to the present. Sound science: How Musical Tones Are Produced. Music is sound! Through demonstration and participation, illustrate the concepts of sound waves, frequency, pitch, timbre and volume using musical instruments and ordinary classroom and household items. 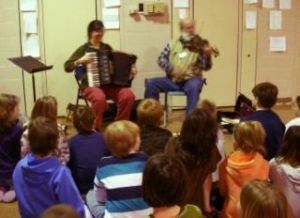 Concerts involving song, instruments, stories, and audience participation. Ask us about other programs! We can work with you to create a music program for your needs.